Israeli violations of international law and international humanitarian law in the Occupied Palestinian Territory (oPt) continued during the reporting period (04 – 10 August 2016). Israeli forces have continued to commit crimes, inflicting civilian casualties. They have also continued to use excessive force against Palestinian civilians participating in peaceful protests in the West Bank and Gaza Strip, the majority of whom were youngsters. During the reporting period, Israeli forces wounded 13 Palestinian civilians; 7 of them in the West Bank and the 6 others in the Gaza Strip. In the Gaza Strip, Israeli forces continued to target Palestinian fishermen and chase them in the sea. In the West Bank, on 05 August 2016, Mohammed Abu Alya (15) sustained a bullet wound to the leg when Israeli forces moved into al-Mughayer village, northeast of Ramallah and stationed at its entrance. A group of youngsters gathered and threw stones at Israeli soldiers who opened fire in response. As a result, the aforementioned child was wounded. On the same day, Hassan Khaled Dabous, photographer at B’Tselem, was hit with a tear gas canister to the hand while covering Na’lin weekly protest, west of Ramallah. He was treated on the scene by the Palestine Red Crescent Society (PRCS) paramedics. On 10 August 2016, 5 Palestinian civilians, including 2 children, were wounded when Israeli forces opened moved into al-Am’ari refugee camp in al-Bireh. They raided a number of houses looking for weapons. Three civilians were wounded with Two Two bullets, one sustained a live bullet wound and the 5th sustained a rubber-coated metal bullet wound to the left ear. In the Gaza Strip, on 05 August 2016, 6 Palestinian civilians sustained live bullet wounds when dozens of youngsters headed to the border area, east of al-Shuja’iya neighbourhood, and threw stones at Israeli soldiers stationed behind the border fence. Israeli forces started opening fire sporadically. As a result, 6 civilians were wounded and then transported to Shifa Hospital in Gaza City. Their wounds were classified as moderate. In the context of targeting Palestinian fishermen in the sea, on 07 August 2016, Israeli gunboats stationed off Khan Younis shore in the southern Gaza Strip opened fire heavily towards the Palestinian fishing boats sailing within the allowed area for fishing. As a result, the fishermen fled away for fear of being killed or wounded. However, no casualties were reported. During the reporting period, Israeli forces conducted at least 65 military incursions into Palestinian communities in the West Bank and 5 ones in occupied East Jerusalem and its suburbs. During these incursions, Israeli forces arrested at least 44 Palestinian civilians, including 3 children. Eleven of them, including 2 children, were arrested in occupied Jerusalem. On 04 August 2016, Israeli forces moved into Yatta, south of Hebron. They raided a house belonging to the family of Mohammed Makhamrah, whose son Khaled (22) was arrested by Israeli forces after Khaled and his cousin Mohammed Ahmed Makhamrah had carried out an attack inside a restaurant in Tel Aviv and killed 4 Israelis on 08 June 2016. In the 2-storey house Khaled’s 9-member family resides on the second floor his his uncle’s 9-member family too resides on the first floor. The house was vacated and a digger then started demolishing the second floor. An hour later, Israeli forces moved into Roqa’a area, west of the city and raided a house belonging to the family of Ahmed Makhamrah consisting of 3 floors and sheltering 7 members. Israeli forces vacated the house while the engineering team planted explosives on the third floor under the pretext it belongs to one of those who carried out Tel Aviv attack mentioned above. Half an hour later, the third floor was bombed, due to which the first and second floors sustained cracks. Concerning house demolitions and demolition notices, on 08 August 2016, Wa’el Barakat from Ras al-Amoud neighbourhood, east of East Jerusalem, self-demolished his house to avoid paying for the demolition costs to the Israeli municipality. The aforementioned person said that he built his house 6 months ago over his old house that was built in 1967. He added that the new house cost him NIS 60,000 and he self-demolished the house to avoid paying expensive demolition costs to the municipality. Regarding imposing strict measures on NGOs work in the city, on 08 August 2016, the Israeli police closed Sa’ed Institution for Educational Consultations in East Jerusalem’s Old City under the pretext of “supporting terrorism”. The police had summoned Jamil Hamami, member of the Islamic Higher Council, the executive director of al-Eman schools and member of the Islamic Culture Society. They handed him the closure decision that was signed by the Israeli police general inspector. It should noted that this is the second time the Institution is closed. The first time it was closed was 3 years ago. On 04 August 2016, Israeli forces demolished a 300-square-meter barrack in al-Radeem area, south of al-Samou’ village, southwest of Hebron, belonging to mohammed Ahmed Mahareq (62). On 08 August 2016, Israeli force damaged a water pipeline between Tubas and Kherbet Yezra in the northern Jordan Valley. On the same day, Israeli forces demolished a residential tent belonging to Zaid Abu Kharbeesh and an under-construction barrack belonging to Mohammed Hussein al-Zayed in Fasayel village, north of Jericho. On 09 August 2016, Israeli forces demolished al-Qal’ah restaurant belonging to Na’el Aqel and a shed belonging to Ahmed Aqel in Sebastya village, northwest of Nablus. On the same day, Israeli forces demolished 5 residential structures belonging to al-Hathaleen family in Kherbet Um al-Khair, east of Yatta, south of Hebron. It should be noted the structures used to shelter 32 individuals, including 9 children. In the same context, a group of settlers moved into Qatef valley near “Rimonim” settlement, east of al-Tibah village, northeast of Ramallah. The settlers attacked shepherds with knives and sharp tools. As a result, 3 sheep were killed and 10 others were wounded. The settlers also set fire to the weeds in the area. Following the Friday prayer, on 05 August 2016, Ni’lin weekly demonstration was organized under the title of “Commemorating the 8th anniversary of the death of Yousef Ahmed ‘Omairah” who was killed on 04 August 2008, and in solidarity with prisoner Bilal Kayid, who has been on hunger strike for 53 days respectively. Israeli forces fired sound bombs and tear gas canisters to disperse the protesters. As a result, many civilians suffered tear gas inhalation, while a cameraman, Hasan Khalid Nafi’ Dabus, from B’Tselem, was hit with a tear gas canister to the arm. Hasan was treated on the spot by a PRCS crew. In the same context, another demonstration was organized in Bil’in village in protest against the annexation wall. Israeli soldiers fired sound bombs and tear gas canisters at the protesters. As a result, many civilians suffered tear gas inhalation. At approximately 13:30, on Friday, 05 August 2016, dozens of Palestinian young men headed to the border fence between the Gaza Strip and Israel, east of al-Shuja’iya neighbourhood. They approached the fence, set fire to tires and threw rocks at Israeli soldiers, who sporadically fired live bullets and tear gas canisters at them. As a result, 6 civilians were hit with live bullets. They were then taken by a PRCS ambulance to al-Shifa Hospital, where their wounds were classified as moderate. PCHR keeps the names of the wounded persons. Note: PCHR keeps the names of the injured persons in the aforementioned demonstrations. Rubber-coated metal bullets are lethal if they hit the head of victim from a close range. At approximately 11:00 on Thursday, 04 August 2016, Israeli forces accompanied with several military jeeps, a digger, a bulldozer, a car of the Organization and Constructions Department in the Civil Administration moved into al-Radim area, south of al-Samou’ village, southwest of Hebron. The bulldozers demolished a livestock barrack built of tin plates on an area of 300 square meters under the pretext of building without a permit. The barrack belongs to Mohammed Ahmed Yusuf Mahareq (62), whom Israeli authorities handed two notices to halt the construction works and demolition in 2013. At approximately 06:30 on Monday, 08 August 2016, Israeli forces accompanied with 5 military jeeps and vehicles belonging to the Organisation and Construction Department in the Israeli Civil Administration moved into Yarza area in the Northern Valley. The jeeps demolished part of the water pipes between Tubas and the abovementioned area. Israeli vehicles demolished about 3000 meters and confiscated 400 meters of the water line pipes and a 2-inch counter. On Monday morning, Israeli forces accompanied with several jeeps and cars of the Organization and Constructions Department in the Civil Administration and a bulldozer moved into Fasaiel village, north of Jericho. The bulldozer demolished a residential tent belonging to Zaid Mahmoud Abu Kharbish. Following that, they demolished an under construction livestock barrack that belongs to Mohammed Husain Hassan al-Zayed. At approximately 04:00 on Tuesday, 09 August 2016, Israeli forces accompanied with several vehicles belonging to the Organization and Construction Department in the Civil Administration and a bulldozer moved into the antiquities area in Sebastiyah village, northwest of Nablus. They demolished al-Qal’ah Restaurant that was established in 2004 on an area of 250 square meters and belongs to Nael Rezqallah Diyab Aqel under the pretext of building without a licence in Area (C). 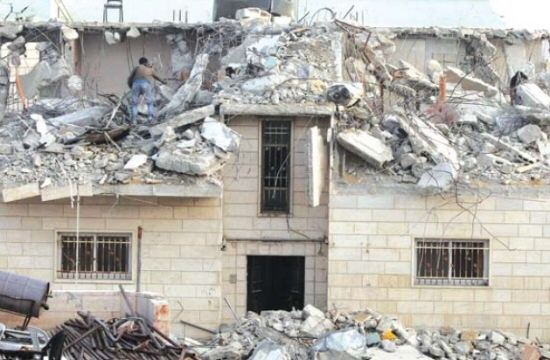 They also demolished a 40-square-meter shed belonging to Ahmed Diab ‘Aqel. It was established in 2010 to sell pottery. Zayed Suleiman al-Hathalin family comprised of 5 members, including 3 children. At approximately 08:30 on Thursday, 04 August 2016, a group of Israeli settlers raided a valley near “Rimonim” settlement established on Palestinian lands in the eastern side of al-Tibah village, northeast of Ramallah. They attacked the Shepherds with knifes and sharp tools. As a result, 3 sheep were killed and ten others were wounded. The settlers also burnt the grass in the area. At approximately 16:00 on Monday, 08 August 2016, Wael Barakat from Ras al-Amoud neighbourhood, east of East Jerusalem, self-demolished his house to avoid paying demolition costs to the Israeli municipality. Barakat said to a PCHR’s fieldworker that the municipality crews raided his house more than ones during last week and handed him a demolition notice of a house he built of metal sheets in the second floor of his house built, which was built in 1967. He mentioned that the self-demolition of his 125-square-meter house cost him NIS 60,000 to avoid paying the demolition costs to the municipality. Barakat added that he and his 8-member family live in the old family house. On Monday, 08 August 2016, Israeli forces closed the office of Sa’ed Institution for Educational Consultations in the Old City in East Jerusalem claiming that it supports terrorism. The Israeli police summoned Jameel Hamami, member of Higher Islamic Council, Executive Director of al-Eman schools, and Member of the Islamic Cultural Centre, to refer to Mascobiyah police center in West Jerusalem. They handed him a notice signed by Roni al-Shaikh, an Israeli Police Inspector General, to close the association. Hamami denounced the closure decision and confirmed that the institute is focused on providing educational counselling for teachers. He pointed out that this is the second time the institute gets closed as it was previously closed nearly three years ago. Fully detailed document available at PCHR official. Press Release by the Palestinian Centre For Human Rights (PCHR): The West Bank witnessed a number of security incidents in which force was excessively used and a number of civilians were arrested in Tulkarem and Jenin. The Palestinian Center for Human Rights (PCHR) follows up with concern these developments in the two cities and stresses the significance of fulfilling the legal and international standards in dealing with civilians in all circumstances and under any charges brought against them. PCHR calls upon the Attorney General to follow up the file of the detainees and to comply with the legal procedures. Moreover, PCHR highlights that security services’ duty is to ban the possession of firearms and maintain the security of civilians within the boundaries of the law with a strict commitment to the relevant international standards, especially the 1979 Code of Conduct for Law Enforcement Officials. At approximately 02:00, today, security services surrounded a house belonging to the family of Ra’ef Fat’hi Rashid Mansour (32) in the southern neighborhood of Kufor Qaleel village, southeast of Nablus, in order to arrest him. A number of the neighborhood residents immediately gathered and threw stones at the police officers who opened fire in response. As a result, a number of civilians were wounded, including a child. On 04 August 2016, the security officers suppressed a protest in front of the Electricity Company in al-Yamoun village that was organized against the power outages in the village. The Company contacted the police after some young men threw stones at the Company. As a result, a large force of security services arrived and started beating all who were present in the street with clubs. The security services arrested 5 civilians on grounds of the incident. On 01 August 2016, the security services launched arrest campaign against 10 members of Fateh movement in Tulkarem under the pretext they spat curses at the Palestinian Prime Minister and Ministry of Local Government on Facebook because of the repeated power outages in the city. Following the arrests, some members of Fateh movement went out to the streets, set fire to tires and opened fire in the air, due to which other civilians were arrested too. A state of tension has prevailed in the city because of the arrests against Fateh members in spite of attempts to contain the situation and the Palestinian President’s personal intervention. In the same context, on 05 August 2016, security officers pepper-sprayed the face of Ibrahim Khreisha, Secretary-General of the Palestinian Legislative Council (PLC), after which he was transported to Tulkarem Hospital. The incident occurred while security officers were attempting to arrest Mohammed Araj, a Fateh member. Meanwhile, some civilians, including Khreisha who was around, intervened to stop the arrest. Khreisha explained that he was attacked after he said to the security officers, “If you want to arrest him, we have no problem, but why you are beating him?” Khreisha added that Araj was beaten while being arrested. PCHR stresses that security services’ duty is to keep the security and safety of civilians and companies and highlights the significance of eliminating the state of possessing and using firearms during protests. Calls upon the Prime Minister, who holds the position of Minister of Interior as well, to fulfill his duties to guarantee security services commitment to the law and dignity of civilians and to apply the law within the international standards relevant to the use of force. Head of the studies and documentation unit at detainees and ex-detainees committee in Gaza Strip, Abdunnaser Farwana, revealed that the Israeli Occupation Forces (IOF) arrested 2,320 Palestinian minors since October, 01, 2015. Farwana said in a press statement on Saturday that the Israeli arrests included males and females of different ages ranging from 11 to 19 years old. 400 of them are still under arrest and are being exposed to serious violations of human rights in Israeli jails. 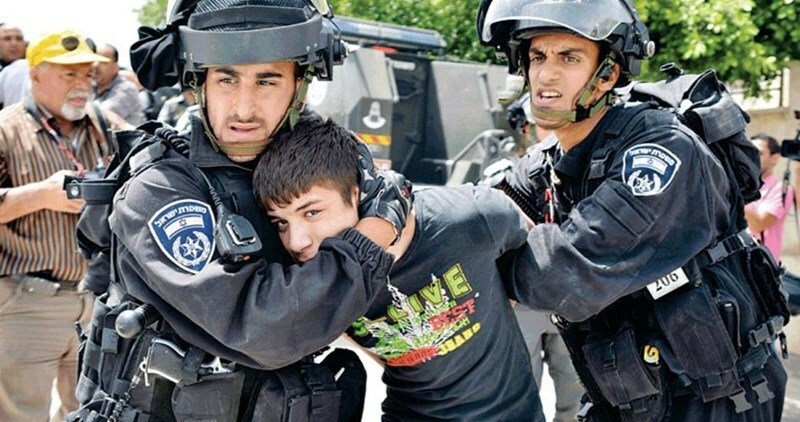 Farwana called on the international community to provide international protection for the Palestinian captives and to confront the Israeli new law which allows the arrest of children below 14 years old in full disregard to its serious effects on the future of the Palestinian children, he said. Israeli occupation authorities are detaining over 7,000 Palestinian prisoners distributed in 25 jails and detention centers. 1,500 among them are suffering diseases and over 750 are held under the illegal administrative detention. The number also includes 70 female captives, 400 children, 6 MPs, and 41 old prisoners who have served over 20 years including 30 detainees who were arrested before signing Oslo accords. The United Nations Office for the Coordination of Humanitarian Affairs (OCHA) issued a report on Friday showing a 40% increase of the demolished homes, 140 houses, in Occupied Jerusalem compared to year 2015. The report demonstrates that twenty Palestinian-owned structures were demolished in East Jerusalem due to the lack of Israeli-issued building permits, displacing 17 people and otherwise affecting another 221. The largest incident took place on 26 July in a section of Qalandia village that falls within the Israeli-declared municipal boundaries of Jerusalem, but is separated from the rest of the city by the Barrier; only one of the 15 structures demolished in this incident was inhabited. This brings the number of Palestinian-owned structures demolished in East Jerusalem since the beginning of 2016 to 114, an over 40 per cent increase compared to the entire 2015 (80). 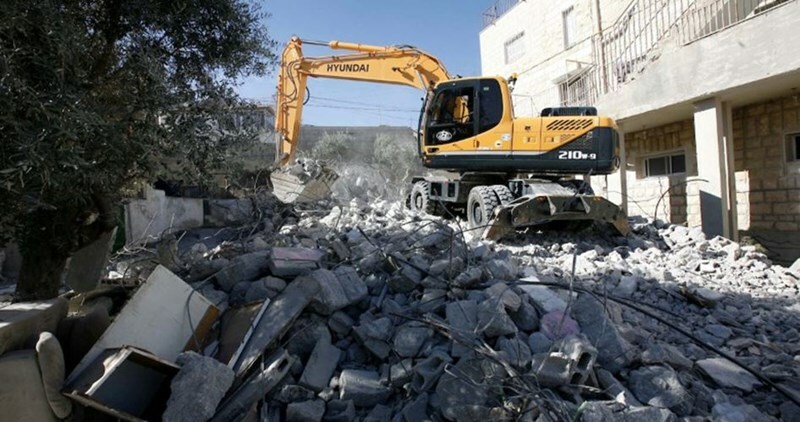 No demolitions were recorded during the week in Area C, however, the Israeli authorities issued multiple demolition and stop-work orders for lack of building permits, which are near impossible to obtain. Six of the targeted structures, including two water wells and one agricultural road, were funded by international donors in Qusra village (Nablus). In the same community, three plots of land that have recently been rehabilitated and cultivated received eviction orders, claiming the land is designated as “state land”. The report points out that Israeli troops killed 60 Palestinians including 16 children and conducted 100 search operations whereby dozens of Palestinians have been arrested since the beginning of 2016. Israeli settlers threw empty glass bottles at a Palestinian-plated vehicle near Ariel settlement (Salfit), injuring a 20-year-old youth. Israeli soldiers injured 67 Palestinians including 14 children in the Palestinian cities whereas two injuries took place near the security fence in the Gaza Strip. Israeli soldiers unleashed their gun fire at Palestinian farmers and fishermen and arrested eight of them after confiscating their fishing boats. The Egyptian-controlled Rafah Crossing remained closed in both directions. Since the beginning of 2016, the crossing has been partially opened for 14 days. Over 30,000 people are registered and waiting to cross, according to the Palestinian authorities in Gaza.